Things look a bit different more than ten years on with Illumina leading the pack and Roche shutting down its 454 sequencing business. I would be curious if anyone else has thoughts about the idea that while patents can reward innovation, they also stifle it. This article on the PCR patent from 2006 suggests that the patent did not impede the dissemination of the technique but this is not exactly the same thing as innovation. 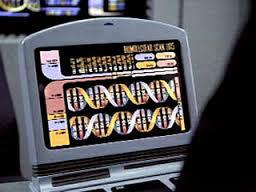 Finally another pressing question I have is why we call it Next Generation Sequencing and if this means that it has something to do with Star Trek. Jonathan says that it’s really all about our DNA sequins. Incorporation elsewhere by no means fully solves the problem, but it’s the best I can do until enough members of the U.S. Congress aren’t owned by trolls and other opponents of reform, notably big pharmaceutical companies, if that day ever comes. More broadly, I suspect patents stifle innovation far more than they promote it. For one thing, patent litigation is expensive, so patents tend to be of little use to people or organizations that aren’t already rich. For example, many years ago, I learned something of the struggles of Philo Farnsworth, a pioneer of television, against RCA. RCA flagrantly violated some of Farnsworth’s patents, and although Farnsworth eventually prevailed in court, it took years, it cost a bundle, and it never paid Farnsworth anywhere near what RCA had made from the violations. For RCA, even though it lost, the costs of the litigation were just a cost of doing business.